The Inhumans are the descendants of the results of a long-ago Kree experiment. 25,000 years ago, the Kree attempted to create a breed of superhuman earthling warriors to fight in the Kree's wars. Their scientists succeeded in creating a small tribe of superhumans but then abandoned the experiment. The tribe wandered Europe and Asia before they settled on a small Atlantic island, Attilan. During the millennia that followed, the tribe developed advanced technology and culture. They encountered the young Atlantean Empire but maintained their independence. The Inhuman culture was devoted to scientific exploration, especially in the field of genetics. They set up a genocracy, a government controlled by the genetically fittest. Early in the Inhumans' history, they discovered the Terrigen Mists, a substance that interacts with human DNA to create superhuman mutations. The first user of the Terrigen Mists was its discoverer, Randac, who developed psionic powers. He instituted the program whereby all Inhumans could be exposed to the Mists. Unfortunately, half of the test subjects developed non-human appearances and the program was halted. The induced mutations passed into Attilans gene pool. In the centuries that passed, discrimination against nonhuman Attilaneans was so pronounced that it prompted a revolt. The revolt's leader, Gral, forced everyone to be exposed to the Terrigen Mists. 75% of Attilaneans developed nonhuman appearances. Successive exposure to the Mists by their descendants only widened the genetic diversity of the Attilaneans. The culture stagnated as people were divided by appearance into "Mutation Camps". This program was discontinued when Gral was deposed by Auran. It was Auran who taught the people to celebrate their diversity and renamed the Attilaneans the Inhuman Race. Attilan's geneticists created vigorous breeding programs designed to re-stabilize their race. 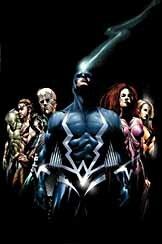 Today, less than half of the Inhumans have a non-human appearance. The Inhumans also developed a cloned race of menial laborers, the Alpha Primitives. The government of Attilan is divided into 2 arms. The Genetic Council's 12 members represent the legislative and judicial branches. The Council elects 1 of its members to be "king" of the Inhumans. He forms the Royal Family, which serves as the executive branch. 110 years ago, the scientist Agon was elected king. He was an extremely popular leader and possessed a brilliant understanding of Terrigen Mist's effects on Inhuman genetics. He convinced his wife, Rynda, to undergo exposure while she was pregnant with their first child. The result was the birth of Blackagar(Black Bolt), the most powerful Inhuman ever. Agon and Rynda persuaded their siblings to expose their unborn children to the Mists as well, resulting in the creation of the unique, high-powered Royal Family. 30 years ago the Kree rediscovered their long forgotten experiment and attempted to reassert their control with the help of Maximus, Blackagar's younger brother. Blackagar exposed Maximus' plot and destroyed the Kree forces. Auran and Rynda were killed when the Kree ship crashed on their lab; Blackagar was elected to replace them as the new king. Blackagar's reign has seen the most rapid change the race has ever undergone. The outside world had finally developed to the point where it could be a threat. Under Blackagar's guidance, the Inhumans developed the technology to move their city intact to the Himalayas. Maximus temporarily overthrew Blackagar and drove the Royal Family into exile on several occasions. The greatest change came when the Inhumans discovered they had a severe allergy to the pollutants created by modern industry. With the Fantastic 4's help, the Inhumans moved their city to the Blue Area of the Moon. The current culture is vital and thriving again: Genetics dominates its every aspect. The Inhumans practice strict population control that has kept their numbers around 1,230 for millennia. Their religion involves ancestor worship rather than deity worship. Their main professions are science-related. There is a small militia of 50 people, but in a war the entire population is mobilized. Inhumans speak their native language, Tilan, and some of the more popular languages, including English, Russian, and Chinese. The Inhumans are considered to be Mutants of the Induced or Breed types. Their actual appearance may be Human, Humanoid, Modified Human with extra parts, Demihuman, or Animal/Alien. Each Inhuman has a single power of Fb(2) to Rm(30) rank. When creating an Inhuman, any resultant non-human appearance may take the place of any actual power. Weakness: All Inhumans have a Molecular Allergy to compounds found in air pollution. The result is physical incapacitation as the Inhuman becomes extremely ill. Normally, an Inhuman would have to make a red Endurance FEAT each week he/she is on Earth. However, Mr. Fantastic(Reed Richards) has created an antidote which enables the Inhumans to breathe the air without harm. Note: Players may want to use this table to find out what effects the Terrigen Mists had on their characters. They can then modify their hero's stats accordingly.